Booker-thon- Kalooki Nights by Howard Jacobson. 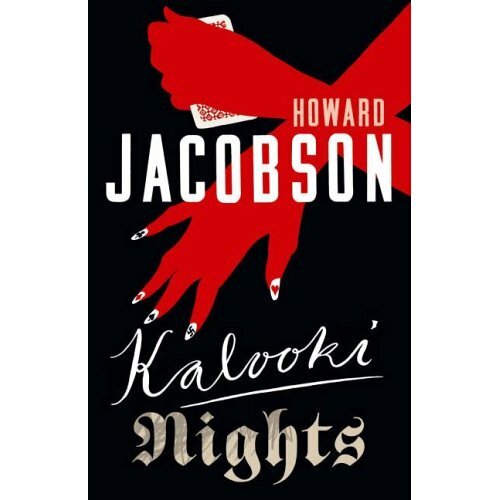 If there is a truth universally to be acknowledged about this whole Booker-thon reviewing caper beyond the complete subjectivity of the exercise then it is this, today A.C.Grayling and I are in complete and perfect harmony in our thoughts about Kalooki Nights by Howard Jacobson. "In this age of lazy reviewing, facile judgment and inflated rhetoric, how is one to convey news of the arrival of a work of genius? This powerful, troubling, moving, profound novel is nothing less.... It is the most intelligent and important novel to appear in this country in years...." follow the link for the rest of this brilliant and spot on review. Would you just look at me telling ACG he's got it right, but actually he has. Back to lower case dgr scribbles. Howard Jacobson dissects every aspect of the Jewish faith, culture and people from within the "self-made immigrant shtetl" (ACG again) that is Crumpsall Park in Manchester and all told through the self deprecating, side-splittingly humorous voice of cartoonist Max Glickman that has you almost crying with laughter. But reader beware, Max's father, Jack "the Jew", was a boxer and this book regularly gives way to a perfectly timed upper cut that lands fairly and squarely, Maxie "Slapsie" Rosenbloom style, bang on your jaw.Then it quietly steps back and watches as you reel on the ropes.You want to cry for very different reasons. "This is a novel of debate, and it is extraordinary how Jacobson achieves every point of view, every possible nuance of attack and defence on the question of the essence of Jewishness — its endurance, the implacable enmities it has suffered, its self-inflicted wounds and obsessions, its unutterable sorrows." The result was for me (and for ACG) an astounding book that I can hardly bear to return to the library and I agree, it almost transcends any prize list.My understanding soared as it just drew me in willingly at every conceivable emotional level.The humour is definitely within the context of the whole book yet you want to read bits out to someone and have them laugh.The bookhound smiled politely but I think was a bit worried because it can all come across as a bit anti-semitic when extracted in this way.The book is far from it. My paced Booker-thon run through the long list was forced to slow to a jog, I couldn't bear to miss a single word, but of course this is only what ACG and I think, you may all hate it. We'll cope. For me there is one book to which Kalooki Nights inevitably directs and compels you, in fact commands you to read and that is The Complete Maus by Art Spiegelman. Brace yourself and read Maus, for me it was a unique experience and one that will stay with me forever. Thanks to the offspringette it was my introduction to the graphic novel which I had marked down as something a bit unsavoury until it was explained to me.Then of course you discover Neil Gaiman and you're away with the genre and occasionally the fairies.